he taught at the same academy and at the Art College of Brera in Milan. Present since the 60s in many art exhibitions: Biennial Bronzetto (Padua), Biennial Sculpture (Palazzo della Permanente - Milan), "Sacred Art in S. Simpliciano”(Milan), Biennale di Arese (Villa Reale in Monza). He has held solo exhibitions and group exhibitions at the gallery-Bevilacqua La Masa in Venice, Gallery D. Fedele in Milan, Center S. Michele di Cremona. He participated, among other, exhibitions "S. Paul in Contemporary Art "(Braccio di Carlo Magno, Vatican City – 1977) and "Pope Paul VI, a light for art " (Museum of the Duomo in Milan / Vatican Museums – 1999). 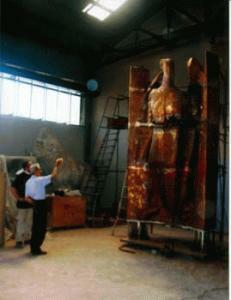 It 'won first prize in the National competition for the sculpture "Giovanni Tavani" in 1989. His works are in public and private collections, such as the Gallery of Contemporary Art of the Pro Civitate Christiana di Assisi, the Paul VI Institute in Brescia, the Diocesan Museum of Milan, and the Vatican. He also made monumental tombs in the cemetery in Milan and other cities of Italy. E’ was a member of the Commission of Sacred Art for the Diocese of Milan. They spoke of him: Bernardini, Cookies,,it,Nicoletti,,en, Boccardi, Bonometti, Brevini, Brugnaro, Carluccio, Minassian, Monteverdi, Nicoletti, Peduzzi, Perocco, Raboni, Scazzoso, Scheiwiller, Severi.